Posted on 11:52 am Saturday, Oct. 19, 2013 by J.W. via DNA testing suggests elusive Himilayan Yeti could be a polar bear hybrid. But, can it defeat a Bigfoot in a fight? Posted on 9:12 pm Friday, Oct. 11, 2013 by J.W. Walker says the robot has about 60 to 70 percent of the function of a human. via Bionic Man Walks, Breathes With Artificial Parts : NPR. Posted on 10:41 am Saturday, Jul. 20, 2013 by J.W. I never considered, not for a minute, was that the nothing that happens on these shows did not even rise to the level of nothing. The shows’ producers are goosing the whole thing so that ordinary nocturnal encounters with, to cite two examples, a horse or an overenthusiastic location-crashing fan of the show are transformed with editing and voice-overs into near-misses with strange beings. Anyway, the point is, on Friday, the outdoorsy types featured in the Animal Planet show “Finding Bigfoot” told a skeptic/blogger that “we’re getting screwed. You people have no idea…” via Southern Fried Science. It’s like he’s talking to me. I really had no idea. Another thing I never properly considered was the gumption of some cryptozoology skeptics to see a thing through. One blogger identified an image of a purported Bigfoot’s eyeball as that of a closeup of a saw whet owl. Never mind how a video of an eyeball got taken seriously by Bigfoot enthusiasts in the first place — seriously, never mind. The eyeball-video people were shopping audio of strange shrieks earlier this year. This eyeball business was first-rate detective work, if probably the most boring Thursday night ever spent by anyone. As is typical at times like these, the debunking revealed a timeless truth about hoaxes: Reality is relentless. The turning point was when our blogger/sleuth noticed peculiarly avian features in the images. “Of course, I’m no bird expert, but I think I know a beak when I see one.” (Of course, you do!) via Ghost Theory. And finally, in October, Yellowstone National Park is going to host a two-day workshop on wilderness tracking. Topics will include “cryptozoology and the public” and “defining and locating rare species,” among other helpful gems. Participants will have to bring their own wooden footprint molds and ghillie suits. via idahostatejournal.com. Posted on 12:42 pm Sunday, Jul. 14, 2013 by J.W. …Apparently, we did need someone else to tell us that, when it comes to Melba Ketchum and her so-called study of so-called Bigfoot DNA, “to conclude anything of substance from the results would be questionable…” via Mother Nature Network and Doubtful News. …A cryptozoology blogger, Craig Woolheater, has gotten into the toy business. He is marketing a “novelty noisemaker” as “tons of BigFoot fun!” (At least it is “battery-free!”) Mr. Woolheater, creator of cryptomundo.com, shilled his wilderness kazoo, ironically, at the exhibition of one of history’s more lackluster Bigfoot-style hoaxes, the Minnesota Iceman at the Museum of the Weird in Austin, Tex. via Virtual-Strategy Magazine. …Mr. Woolheater is also is hoping that some of the dreamy, outdoorsy types who respond to Spike TV’s $10 million Bigfoot bounty will use his “SquatchIt Bigfoot call device.” Which, if nothing else, should result in a healthy increase in the number of folks who swear that, Wait a minute, I’ve just heard Bigfoot. via Digital Journal. Posted on 9:54 am Friday, Jul. 12, 2013 by J.W. …Les Stroud, the Canuck wilderness fanatic whose “Survivorman” show somehow did not manage to sustain the interest of the “Real Housewives” franchise, is making another run at those Mahnolo Blahnik-aided heights. He has in the works a new program, featuring himself and the cryptid fanatic Todd Standing, canoodling with “supposed colonies of unidentified primates living between Banff and Kootenay National Park…” via metronews.ca. …Some yutz phoned the Royal Society for the Prevention of Cruelty to Animals — in Britain, mind you — to report a “sighting of Bigfoot, the legendary US version of the Abominable Snowman.” via The Sun . Posted on 11:55 am Monday, Jul. 8, 2013 by J.W. via How the attempt to sequence “Bigfoot’s genome” went badly off track | Ars Technica. A simpler explanation might be, you know, that one of the groups is bonkers. The key problem with “sequencing Bigfoot’s genome” is, of course, that there is no such thing as Bigfoot. But an attendant problem stems from the current mania for crime-themed entertainment. Anyone who watches television for more than a few minutes could be forgiven for believing that police investigators can solve any mystery, just so long as they can collect enough schmutz from the right places. Whatever else, that is just gross. More to the point, “Finding Bigfoot” has been on TV for four seasons. Note the present progressive tense in the program’s title. Obviously the act of finding implies that the looked-for object will be found, but it also makes it clear that whatever it is has not been found. The finding is ongoing. Taken further, it means that it can never be found; this is why movies about time travel are so complicated. It is interesting to note, too, that there are well more than a dozen television shows on so-called paranormal phenomena being produced in the world, not including programs about Bigfoot. None of these, through hundreds of episodes and decades of taping, have made a single, credible determination. The greatest achievement of this pursuit has been the cultivation of the nimble intellectual dexterity needed to patch the inevitable holes in the story of whatever-it-is. Are you kidding: Bigfoot? Yeah, why not? Where do they live? In swamps, forests, mountains? O.K., seriously now, how can a stable breeding population of Bigfeet exist for centuries without being detected? They’re sneaky. Are they also burying their feces? You’re gross. (Sigh.) But why has no hunter ever killed one? There are few hunters and lots of empty spaces. That’s where you are going with that? Sure. Paul Fussell, in much more serious circumstances, wrote that “irony is the attendant of hope, and the fuel of hope is innocence.” For the Bigfoot finders, it must be a tortured existence. The moment one of these poor hairy bastards is dragged out of the deep woods, covered in ticks and howling in anger, those TV shows will be sent straight to public television. Bigfoot skeptic has no head for landscaping. Posted on 12:25 pm Tuesday, Jul. 2, 2013 by J.W. via Bigfoot Skull Allegedly Found In Utah, Todd May Discovers Rock That Looks Like Sasquatch [PHOTO]. Newspaper columnist ignores possibility that bigfoot is giant opossum. Posted on 12:24 pm Tuesday, Jul. 2, 2013 by J.W. …and I asked about the Bigfoot DNA. It was, he told me, a mix of opossum and other species. via I had the ‘Bigfoot DNA’ tested in a highly reputable lab. Here’s what I found. | SciGuy | a Chron.com blog. Posted on 6:07 am Wednesday, Nov. 28, 2012 by J.W. via DNA study suggests Bigfoot exists | Statesman Journal | statesmanjournal.com. The report contains several bombshells, not including the assumption that such creatures actually exist. •Sasquatches are apparently, definitively, the result of a pairing at some time in the last 15,000 years of a homo sapien female with a male of an unknown species, confirming the widely-held belief among male cryptozoologists that some dames simply can’t keep their hands off a really rugged man. “The male that procreated is unidentifiable,” said the former veterinarian who organized the research, leading her fellow female cryptozoologists to retort, Isn’t that just like a man? •Thirteen laboratories around the world — 13! — were said to have participated in the research. That means there are 13 awkwardly-written press releases yet to be written. And 13 laboratory budgets yet to be defended from the criticism of 13 skeptical, head-scratching governing boards. •Finally, the news has fatally ruptured an already restive “Bigfoot-believing community,” leading to hair-raising recriminations as researchers trample long-held opinions. These folks have, again, I am guessing, argued for years that Sasquatches are more ape than human in bald defiance of the (guessing!) probably-hairier-than-normal folks dragging their knuckles and claiming that the creatures are more like people. “They can’t back away from that,” the writer said. No, they can’t. But there are more important things to consider. 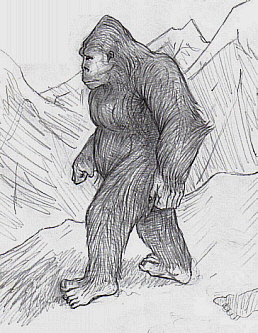 News of intact Sasquatch genomes — apparently, lab workers were able to sequence three of them — has cryptozoologists already concerned for the well-being of the never-seen-or-captured creatures. A few mused about the potential array of federal protections that could be legislated. At least one correctly surmised that some people will want to kill even imaginary monsters.